The post-apocalyptic world is a messy place. Pretty much all the useful stuff has been destroyed or reclaimed, and you’re left with a city full of garbage. Fortunately, you’re smart. You can take that garbage and turn it into something useful. Tools and weapons for your survival. But there’s one place left where civilization carries on. In the Golden City, luxuries are plentiful. But you’ve got to earn your way in. Will you earn favor, perfect your skills, or just get some jobs done to earn your way in? Will you be the first, or will someone else beat you to the opportunity, closing the doors of the city forever? Welcome to the world of Raid & Trade, currently seeking funding on Kickstarter. Raid and Trade pits 3 to 5 players against each other in a race to raid abandoned homes, collect resources, and attack other players to achieve victory. There are 3 potential victory conditions; earn 10 favor points, get your skill level to 20, or complete 3 Quest cards. 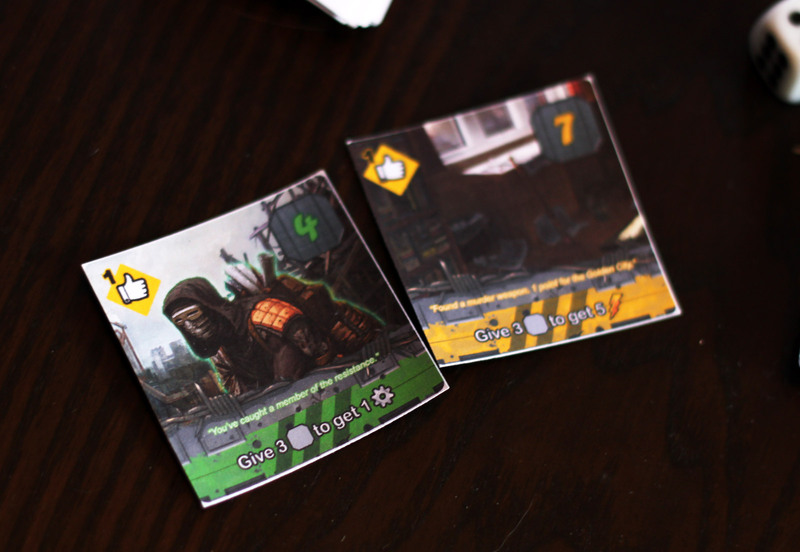 The game is broken up into rounds; each round, players get 15 action points to spend. Players take turns in clockwise order performing 1 action at a time. Each action may require a different amount of action points. The map is made out of 9 square tiles with roads, houses, and barriers on them. The basic game has you align the tiles in a 3×3 grid, while advanced players can create any arrangement of tiles they wish. Players can travel freely along the roads but must spend action points to cross barriers or to a new tile. The possible Actions are: raid a house, attack another player, trade with another player, craft an item, or enter the outpost. In addition, players may spend AP to move before or after their action. Quest cards can be completed without spending AP, and Incident cards, spread around the map, can be recovered by spending resources. Raiding is the primary activity that will happen. When you raid, you must be next to a house. Three levels of house – green, yellow, and red – cost increasing amounts of AP to raid, but may offer higher rewards. To raid you draw a card from the corresponding deck. 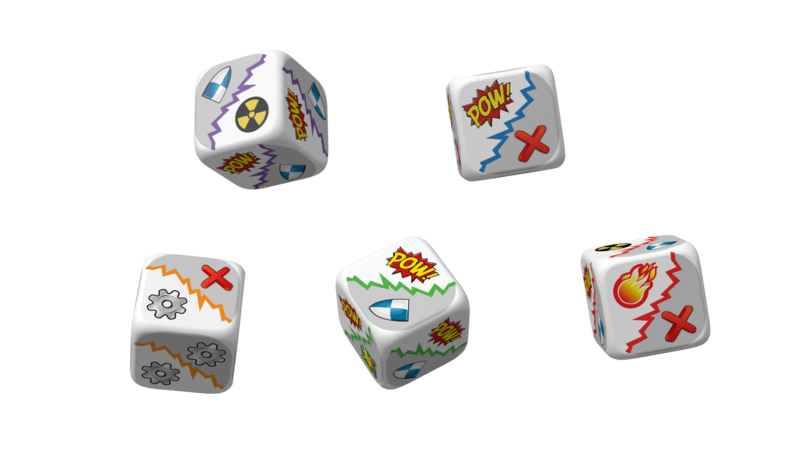 Some Raids require a die roll – you get a certain amount of resources, but if you succeed on the die roll you get an additional supply of resources, and a special action you can immediately perform (such as trading resources for Skill Points). Other Raids require you to sacrifice some Favor (or gain Blacklist points if you’re already at 0 favor) in order to attain the resources. Resources are drawn randomly from a bag, and represent various items you may collect – tools, medicines, food, weapons, spare parts – and can be used to craft items, in trade for other resources, or to complete quests. When you engage in combat against another player, you roll dice against each other. The results vary depending on the character; you may win the battle outright, or you may gain other resources or skill points. The defender also has the option to roll a die and may successfully defend the attack, or gain some resources of their own. Defeating a player in combat lets you take a resource or favor disk from them. The outpost is a place to go primarily to earn Favor points. You can enter the Outpost for an action, and for a later action spend AP to gain favor. The game ends when a player has completed at least 1 of the 3 victory conditions (20 skill points, 10 favor, or 3 completed Quest cards), and then spends 20 AP to claim victory. This can be quite difficult, as players are only granted 15 ap each round, meaning they’ll need to find some way to score addition AP to win. 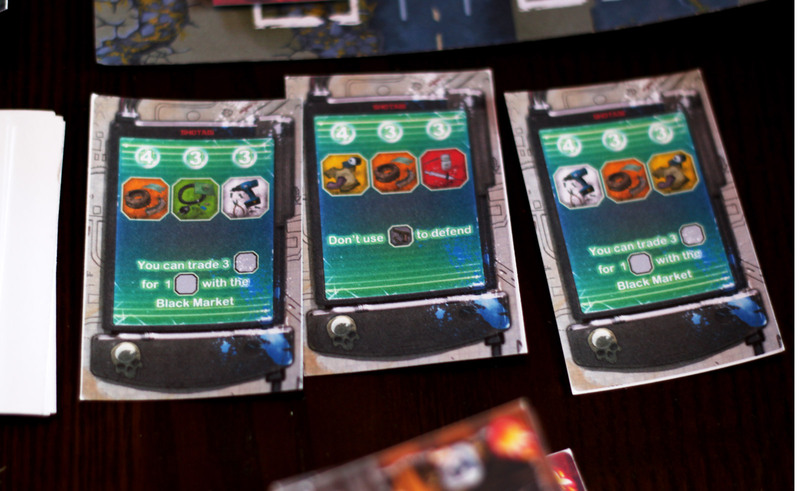 The most standout thing about Raid & Trade, for me, is the theme. “Post-apocalyptic” in and of itself is not new to the cardboard scene, but it’s almost always been synonymous with zombies. There are no animated undead to be found here, not even a hint; this is purely about survival in a place where resources are not plentiful. And I think the theme here is implemented very well. This is an ameritrash-style game straight through, and the theme is reinforced in your actions. The board, while it does have some semblance of order, looks haphazard and messy. Houses are scattered chaotically around, and when you raid them you never know what you’ll find. The blind draw of resources here reinforces this; you’ll actually collect a decent number of tokens when you raid, but what you draw will be an eclectic mix of found items. In other words, it’s junk, and it takes a lot of junk to get something useful. You’ll also get into run-ins with the other players. It’s just inevitable; not only do you get to take something useful if you win an attack, but you have a chance gaining other benefits. This is a nifty little idea that takes combat beyond “I punch you and take my stuff” – you may lose a combat but gain some valuable skill points, or destroy an item the other player needed. So you may have guessed by now that this is definitely a “take-that” sort of game – dice will hate you or not, other players will come and kick you and take your stuff, and you’ll do the same to them. Aside from combat, Incident cards, as well as crafted items, may provide screw-you sorts of abilities. The roughest is “cancel an action AFTER AP is spent” which, depending on the action, can be a big penalty. But it goes back and forth, and each card play is probably less powerful that it seems at first. It’s a little difficult for me to talk about balance here, which is unfortunate. I don’t mind take-that games, but I do think there needs to be a systems of checks and balances to make a take-that game fun for all players. The different possible ways to pull one over on another player should be relatively equal in power. And while this sort of game inevitably results in swinginess, the game should push forward towards the endgame, and the swings should be a relatively small percentage of the journey towards victory. But I received a fairly early prototype copy, and the rules are still being tested and updated, as are the components. The copy I tested is now out of date; which is good, because a lot of what I have seems fairly imbalanced. Some of the raids seemed skewed – in one round, a player payed 10 AP to raid a Red house, scoring only 4 resources (They did, admittedly, have a chance to gain 7 resources and trade some for a Skill Point, but failed the die roll). The very next player spend 6 AP to raid a Green house, scored 4 resources, a favor, and the ability to trade resources for skill points. While I realize that risk is in the business, and part of what can make a game like this exciting, spending more AP for the Red house raid should guarantee better results; the cheaper option should be more risky, but from what I can tell it’s not. The crafted items – unique to each character – also seemed like they could be imbalanced. It’s hard to judge for sure without playing over the long term, but a few items stood out. One character had an item that gave them 6 extra AP when spent – that would certainly make achieving the 20 AP cost to end the game a lot easier, while other players would need to struggle to collect food and other items to inch their way up. But, as I said, my version is an earlier prototype. The components have already been updated. I can’t comment on whether or not they’ve been improved, since I haven’t seen the new components, but Mage Company does have a decent history of producing well-rated games, so it’s likely these balance issues will be sorted out. There is one other thing I worry about, although I haven’t encountered this. It seems like it’s very possible that the game could grind to a standstill. 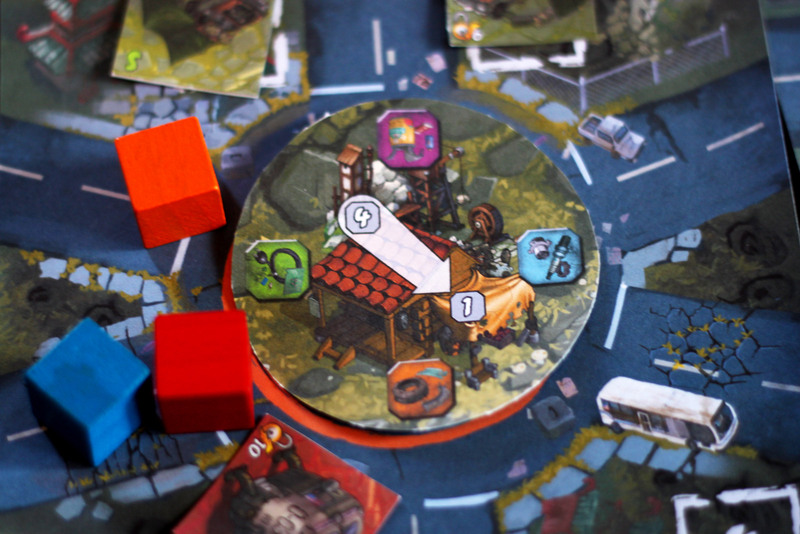 The resources here are finite; each time you raid a house, that house is removed from the board. Once all the houses have been removed, there is no apparently way to collect more resources; which means it may be difficult to reach the endgoals. Now I think there are a lot of resources in the game so this shouldn’t happen, but there are plenty of ways for resources to be spent or destroyed, and a few overly-aggressive or just plain foolish players could dry up the resource pool. Again, this is just a theory; I have no proof that this will or even can happen. At the very least, the Outpost building allows players to collect Favor by spending only AP, so perhaps a resource-dry game would result in a final, pitched battle around the Outpost to see who can get enough Favor first. Yet that would probably be a slow, tedious process. Okay, moving on. Mage Company has a good enough reputation that I think in the end, Raid and Trade will be a solid offering. It’s got a great post-apocalyptic theme without resorting to monsters and zombies. 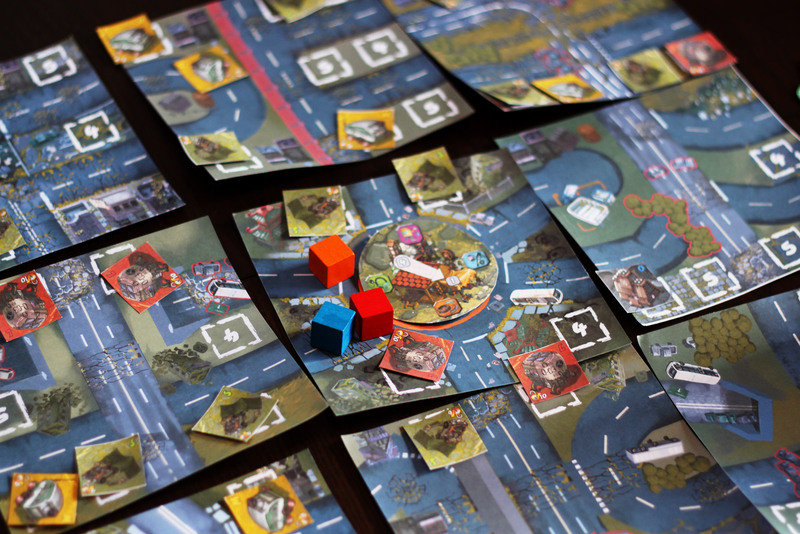 It pits the players against each other in a desperate race for survival, but the focus is on collecting resources. So while combat is an option, it is not the central element and there are a few possible paths to pursue victory. The thematic elements of the game work really well, and if you’re into this sort of game, you’ll probably have a good time bustin’ down doors to hoard garbage that you can eventually turn into something useful. Ready to jump into the fray? 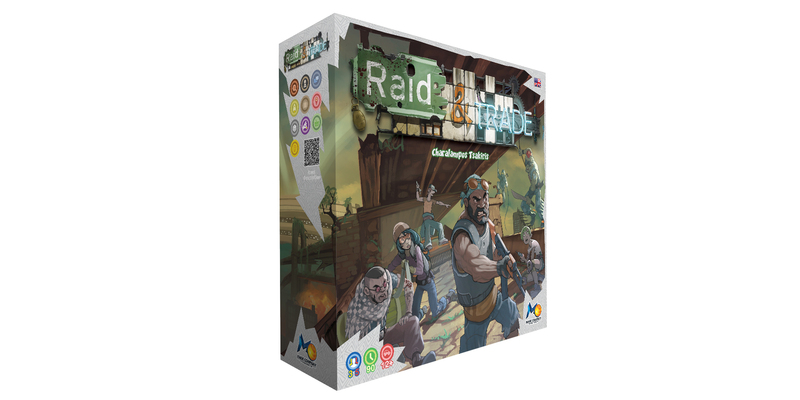 Head over to Kickstarter to back Raid and Trade now. Yes the rules have been changed. There is no more than 3 AP now, the cards have been balanced. New items were created, now each player has same amount of items. Te effects are balance. 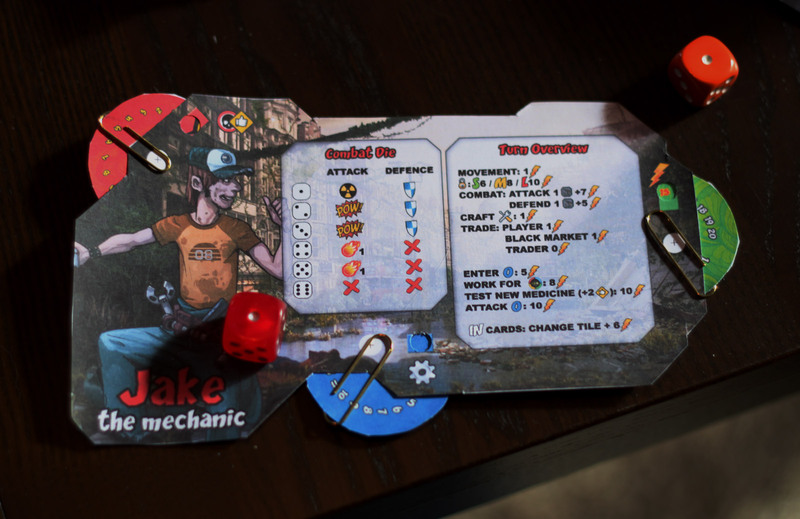 We have added a mechanic for the incident cards and how they play in the game and much more. Indeed that copy should be really early. We missed that. Soon the final rules will be online, with index, glossary, detailed examples et.